The face of war is changing, and it may no longer be a human one. Developing new technology has always been a cornerstone of a successful military force, but now those technologies are steadily moving human soldiers from combat to management positions. Virtually every major military power is working on robotic weapons. In short, we’re outsourcing more and more of war into the hands of robots and computers. Even the conventional foot soldier has robotic and biological augmentation in his/her future. Today, Singularity Hub is taking a wide-angle look at these changes and how they will change the nature of war and our world. Forget the future for a moment, and just consider our present. The U.S. military employs more than 7000 unmanned drones in operations all over the world. Even just 15 years ago, the number of active drones was just a few dozen at most. Now, the use of Predator drones is regularly covered by major media outlets. The Predator, an unmanned, remotely flown drone capable of delivering explosive payloads, is able to seek out and destroy hostile targets thousands of miles from the soldier controlling it. A Raven drone, another Unmanned Aerial Vehicle (UAV), is capable of short range reconnaissance and lightweight enough to be carried into the field by a foot soldier. See the video after the break. These UAVs are just the tip of the drone iceberg. Besides specialized anti-munitions drones, defense turrets, and surveillance drones already in use, the U.S. military is developing rolling ground vehicles, water surface vehicles, and remote bombers that could all see action in the next few years. There are several competing models for each category, but the Crusher (ground), X-45 (air), and USV (water) are advanced enough to have videos available on the web. Each of these drones would be piloted by controllers many miles away from the field (eventually even from the other side of the world). Closer to home, pocket sized reconnaissance drones may become a part of every soldier’s arsenal (like the Ember from iRobot we talked about recently) , allowing them to explore dangerous areas without risking their own skin. Singularity Hub covered the release of P.W. Singer’s new book Wired for War, an overview of how war and technology are evolving together. Singer highlights how quickly drones have been adopted by the U.S. military, taking on mission-critical observation, hunter-killer, and counter-strike roles. The ability to remove a soldier from danger but keep him or her in direct control of a situation is so desirable that is it actively changing the way operations are planned and executed in the Iraq War. Unmanned drones are, in part, the U.S. answer to IEDs and guerilla warfare. In many situations drones not only keep humans from danger, but they also perform their duties better than a human could alone. A predator drone releases a hell-fire missile. Not all robotic systems in the military are super-powered versions of remote-controlled vehicles. Many are reaching levels of autonomy that allow them to be observed rather than controlled. Primary and most widely-spread of these are targeting systems. Bomb and missile guidance requires pinpoint accuracy and split-second reactions. As such, most aircraft and naval level ballistic weapons are aimed and guided with computer assistance. Humans pull the trigger but computers hit the target. Often, the computers also tell the humans when they should pull the trigger in the first place. Advanced drones like the Global Hawk or the CRAM often work with minimal interference by human controllers. The Global Hawk is an aerial drone that, according to P.W. Singer, is effectively replacing the U2 spy plane. It can take-off, fly 3000 miles, complete its mission, return and land autonomously. Human pilots set its mission parameters, but otherwise are minimally involved while it is in flight. CRAM (counter-rocket artillery mortar) is used in the Iraq Green Zone to provide automated turret defense against surprise rocket and rpg attacks. Much faster than a human could even begin to command it to fire, the CRAM shoots down harmful attacks completely based on its own parameters. Besides turning CRAM on and off, humans are negligible in its operation. By design. This trend is set to continue. The data that drones collect is already too vast for humans to review on their own. New computer algorithms, or AIs will have to be developed to sift and prioritize this information. This will further push humans into a managerial role. In the not too distant future, machines may take on very complex roles, such as security. Singularity Hub already discussed the way that security checks are advancing in form and function, and now those same security checks can be integrated into drone technology. Anti-sniper turrets could scan and recognize hostile objects or human posture, attacking with lethal or nonlethal countermeasures as needed. Once these systems prove themselves in field testing, the military will use them. The rapid adoption of drones is sure proof of that. But can we trust computers and robots with situations in which they may use lethal force against civilians? Opponents to a computerized military often point out that computers will make errors, it’s inevitable, and they will kill innocent people. Maybe they’ll assume a man running from an explosion was responsible for setting a bomb, maybe they’ll shoot a smoking truck because it resembles a suicide bomb attack — the possible scenarios are nearly endless. Of course, humans have already made these exact same mistakes. We need to remember that no soldier, human or robotic, can perform perfectly and they often kill innocent civilians. That’s an argument against war altogether, but as long as robot/computer error is comparable or less than human error it’s no argument against using robots in the field. 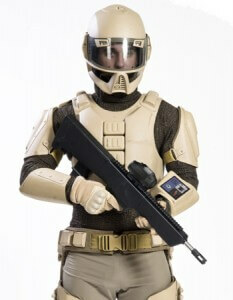 A concept photo for the U.S. Army’s Future Soldier 2030 program. As robotics and computer technologies improve, will humans even have a direct combat role? The U.S. Army is answering yes for now. Their Future Soldier 2030 program is an approach to augmenting human soldiers to become mobile combat platforms. Hundreds of millions are being spent on this new initiative and probable goals include: powered exoskeletons, advanced armor, enhanced metabolisms, advancing sensing, HUDs, and increased/variable lethality. If you’ve seen it in a science fiction movie, chances are the army is willing to consider it. Under this initiative, the new soldier is viewed more as a machine than a grunt. Like all machines, it will be inspected to insure that it is well maintained. The Pentagon has been pursuing implantable Radio Frequency IDs (RFIDs) since 2007. These RFIDs should be able to not only track the solider of the future, but also relate his or her health to commanding officers back at base. Even with just $1.6 million in funding, the RFIDs are seen as a serious possibility for all field-operative soldiers. And if a soldier is injured? The Pentagon recently completed phase one of its regrowing limbs research experiment. As of March of this year, military labs are able to turn skin cells into a blastema, a type of cell that can be converted into different kinds of tissue. The next phase will be to get that blastema to convert itself into muscle, bone, or nerve cells as needed. DARPA is spending more than $4 million to try and make the future soldier telepathic. Singularity Hub loves to discuss mind-reading machines, and apparently DARPA does too. Rather than pursue some sort of traditional ESP, or telepathic communication, DARPA is looking into computer-mediated brain to brain networking. The soldiers of the future may be able to have their helmets read their thoughts and transmit them to their squad so that the entire unit can act as one. With this huge wall of technology looming behind them, what do our military leaders plan on changing? First off, the budget. U.S. Defense Secretary Robert Gates revamped the Pentagon’s budget in April so that it reflects not just the new kinds of technology, but also the new kinds of war. He plans on spending about 50% on conventional warfare, 10% on irregular warfare, and 40% on dual use materials and personnel. This includes a $2 billion dollar increase in drones like the Predator. This shift in spending reflects the new combat situations that the U.S. military is facing. The U.S. really hasn’t fought a conventional war since Korea, maybe since WWII. Most of the military actions taken have been in asymmetric warfare situations: guerrilla tactics, counter-insurgency maneuvers, peace-keeping missions within civilian populations. Those aren’t the times to rely on big tanks, fighter jets, and battleships. The wars of the future are going to focus on surveillance and information. Finding that one terrorist among the thousands of innocent civilians and neutralizing him or her quickly will be more important than devastating nuclear weapons. Quick assessments, and rapid reactions will dominate the field, and those requirements are best served by computers and machines, not humans. We are looking at a future where war is the split second recognition of a small, deadly threat that is eliminated by a computer. And that, my friends, is where this goes from a serious and interesting discussion about technology to a rather scary realization about the future. Irregular wars? They look a lot like occupying forces performing police actions. Or like governments being able to kill dissenters in their beds. Even if we want to trust the soldier-managers of the new drone armies, they may be too far removed to feel the emotional impact that causes the common soldier to recoil from committing atrocities. How much do you regret killing someone in a video game? By replacing soldiers with computers we may be removing what little morality is in war. At the same time, we may be increasing the number of people able to create a military. Most of the surveillance devices can be constructed or even purchased by civilians. According to P.W. 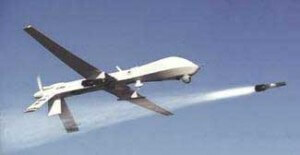 Singer, spy drones are already in the hands of border-guard groups that have no official sanction by the U.S. military. While artillery is tightly controlled, these surveillance bots give a great tactical advantage in the field even if they’re not armed. Undoubtedly the future of war will look different. Drones will take an ever increasing role, and in different sizes, from nanotechnology to huge air fortresses that don’t need to land but once a year. Those humans still in the field will be augmented by equipment outside and inside their bodies. The whole system will focus on quick reactions to small scale threats while still being ready for large-scale confrontations. These same tactics may creep into our police forces, or even find use by private citizens. Yet, despite these changes, some things about war will never change: it will be terrifying, deadly, undesirable, and perhaps necessary.